The expansive soils pose lot of problems due to their behaviour of swelling/shrinkage upon wetting or drying. Most part of central India and southern India is covered with layers of expansive soils. Due to the increase in population and increase in per capita demand of land, engineers have to construct various high rise structures on expansive soils which generally pose cracking problems in the buildings. Granular pile anchor is a new technique generally adopted to enhance the uplift resistance of poor expansive soils, such as loose sands, soft clays, black cotton clays etc. 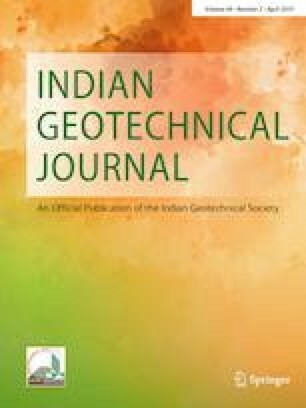 This paper presents a numerical study to predict the uplift performance of granular pile anchors (GPA) in expansive soil using 3D finite element PLAXIS software. The effect of length (L), diameter (D), and number of the GPA at different spacing (S) values on uplift capacity is analysed by applying prescribed displacement of 10% of pile diameter at the centre of granular pile anchor. Further, length to diameter (L/D) ratio of single pile and group pile was analysed using different parameters. The resistance of granular pile anchors against uplift forces with variation of modulus of elasticity of soil is also analysed. Based on the numerical analysis, it is observed that the uplift capacity of granular pile anchor increased with increase in length and diameter of pile for both single pile and piles arranged in a group. Further, on increasing value of modulus of elasticity of soil, there is increase in pullout resistance. The efficiency of GPA is also evaluated which helps in the selection of various parameters of granular pile anchor.